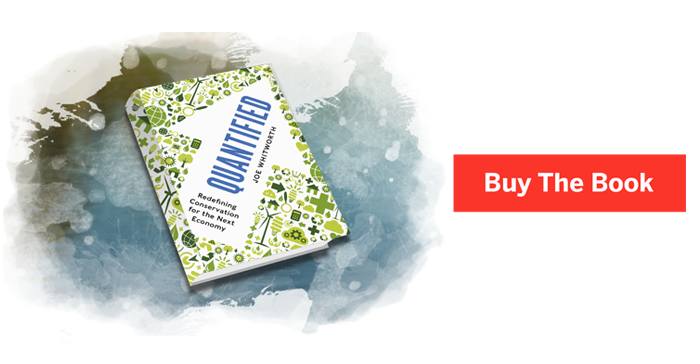 In Quantified, Whitworth draws lessons from the world's most tech-savvy, high impact organizations to show how we can make real gains for the environment. Google, Apple, Amazon, Uber: companies like these have come to embody innovation, efficiency, and success. How often is the environmental movement characterized in the same terms? Sadly, conservation is frequently seen as a losing battle, waged by well-meaning, but ultimately ineffective idealists. In Joe Whitworth’s first book “Quantified,” published by Island Press in September 2015, he argues it doesn’t have to be this way. In fact, it can’t be this way if we are to maintain our economy, let alone our health or the planet’s. Whitworth draws lessons from the world’s most tech-savvy, high-impact organizations to show how we can make real gains for the environment. The principles of his approach, dubbed quantified conservation, will be familiar to any thriving entrepreneur: situational awareness, bold outcomes, innovation and technology, data and analytics, and gain-focused investment. This no-nonsense strategy builds on the inspirational environmental work begun in the 1970s, while recognizing that the next economy will demand new solutions.